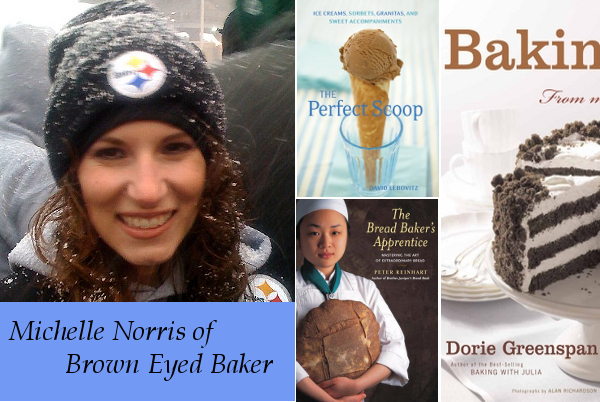 Michelle Norris is the blogger and baker behind Brown Eyed Baker, a "sweet, savory, sinful" blog that features recipes and posts about breads, desserts, and other tempting baked goods (with an occasional savory dish thrown in). 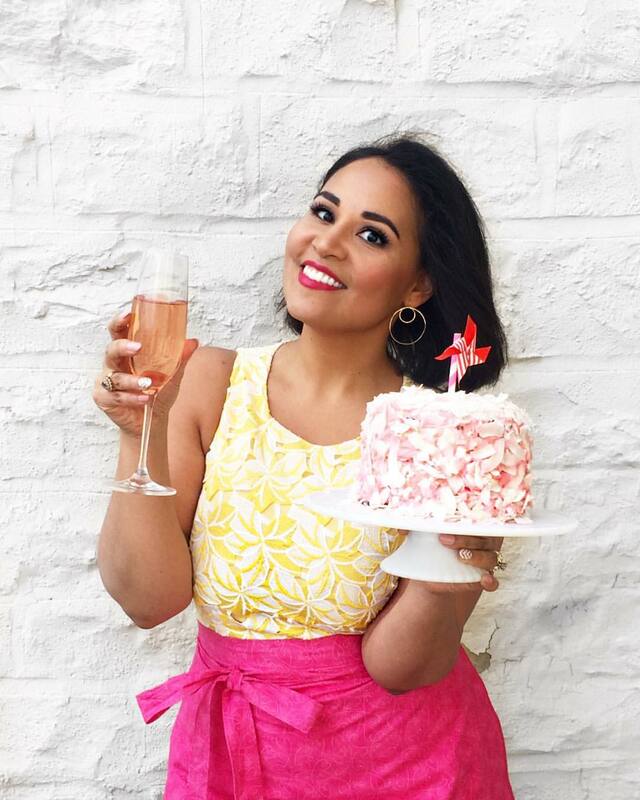 She also writes "how to" articles, such as the recent four-part series on how to build and stock a baking pantry, which are an incredible resource for novice and seasoned cooks alike. Michelle is a marketing analyst by day, and has recently started her own baking business selling cakes, cupcakes, and cookies to a clientele of local Pittsburgh-area customers. Readers of her blog who live too far away may also soon be able to taste these goodies for themselves; she's currently working on making a selection of her cookies available for online purchase and shipping. Those stains on well-used cookbooks are often a badge of honor for passionate cooks and Michelle is no different. "I get such a sense of pride when I go to leaf through a cookbook and the pages stick together," she says. "It makes me feel accomplished in the kitchen." 1. Baking: From My Home to Yours by Dorie Greenspan. I received this book for Christmas 2007 from my sister. I had heard a few other bloggers singing its praises and was so excited to finally have it in my kitchen. The minute I opened it and started reading the forward, I was in awe of Dorie. She is a home baker, like so many of us, and just wants to share her love of baking with others. I have made dozens of recipes from this book, but my top 3 are probably Hidden Berry and Cream Cheese Torte, French Chocolate Brownies, and the Perfect Party Cake. I purchased this book with a Barnes & Noble gift card I got for my birthday a couple of years ago, but it was some time before I finally cracked it open. Once I did, I found that I couldn’t put it down. The entire first part of the book is written almost as a textbook, with a large amount of information about the science behind bread baking. This serves not only as a great introduction for a beginner bread baker, but also as a fabulous resource for even the seasoned veterans. Of all the baked goods I have ever made, the one that my boyfriend requests more than anything else is Cinnamon Raisin Bagels from this book. He likes them toasted with butter, while I prefer cream cheese or peanut butter. Any way you top them, you can’t go wrong! This may be a biased selection since I've just spent the entire summer churning ice cream, but this book IS sticky! Since I was new to homemade ice cream, I wanted a book that could serve not only as a source for great recipes, but also as a resource I could use as I delved into the world of homemade ice cream. This book delivered in every way I had hoped. The book has an entire section devoted to equipment and techniques, and dozens of incredibly delicious recipes. I could have eaten the Tin Roof Ice Cream all by myself (and just about did!). The Chocolate Ice Cream is the richest, most intense chocolate ice cream I have ever eaten. On top of these great recipes, I was able to use the methods and techniques to create my own recipes for things like Pistachio Ice Cream. Loving this series! That Dorie Greenspan book is a treasure. Hehe, one of those books is one of my choices as well and the other two are books I've been lusting after for a while! Lovely to know more about the 'Brown Eyed baker' who I've tweeted with often on good old Twitter. Wonderful to meet Michelle. All 3 books are on top of my lust list...living in India makes the book so much more expensive...sigh! Great post! Thank you for having me! This was so much fun to do!